It is with much sadness that the Ministry of Defence must confirm the death of Corporal Steve Edwards 2nd Royal Tank Regiment in Basra City, southern Iraq on Tuesday 31 July 2007. Corporal Edwards, known as ‘Eddy’ to his friends, was on a routine patrol in the Mustashfa district of Basra City when his Warrior Armoured Vehicle was struck by an Improvised Explosive Device shortly before midnight local time. Corporal Edwards was checking the safety of the soldiers travelling in his vehicle at the time of the attack. A member of Badger Squadron, 2nd Royal Tank Regiment, attached to the Irish Guards Battle Group, Corporal Edwards was working under the command of 4th Battalion the Rifles. He had been in Iraq since early May, consistently involved in operations in Basra City. Corporal Edwards leaves behind his wife, Gabie, his parents, and his 18-month-old son, Ryan. It is with great sadness that I am writing about the loss of another of my soldiers; Corporal Stephen ‘Eddy’ Edwards. I have known Eddy for several years and have many fond memories of him, particularly our two years together in 2002/03 when he commanded my squadron’s ambulance. That period included the Iraq War and we shared many good and bad times. We also shared many moments together after I had cadged yet another fag off him. He was a cheerful, enthusiastic man who was very proud to be a part of our Regimental family. He was a ‘Tankie’ to the core: proud, loyal and professional with an excellent esprit de corps. His years of experience and kindhearted nature will be a great loss to us all. Eddy epitomised all that is good about our soldiers, an example to all. Our thoughts now go to his wife, Gabie, his son, Ryan, and his parents and family. Corporal Steve Edwards had been a part of the Battle Group since his Squadron was first attached to us in early March. He was the embodiment of what I have come to know and love of the men of Badger Squadron. A larger than life character with an abundance of soul, drive, dedication, loyalty and professionalism; he was a blessing to commander and subordinate alike. He knew his job inside out and worked tirelessly to achieve only the highest standards. He understood the importance of leadership and was a gleaming example to those less experienced than he was. Selflessly committed to his men and his Regiment he was a model of resilience in the face of adversity; a smile never left his face. His men responded to a touch that is difficult to define and a sense of humour that inspired. His departure will leave a hole in Badger that will be difficult to fill. His knowledge, experience and ability as a commander, together with his selfless and caring approach marked him out as a non commissioned officer of distinction; there aren’t many who are able to live up to his standards. The effect that he had on the men of his Company, who had only known him for a short time, bears testament to his all consuming, infectious character. The thoughts and prayers of all members of the Battle Group are with his wife, his son and the rest of his family and friends. Corporal Stephen ‘Eddy’ Edwards truly was all things to all men. He was the voice of experience and the guiding hand to those in the Squadron he worked with. He had a strong, calm nature, not a person who was easily flustered by anything. I know that over the course of the last few months, through the highs but especially the lows, other members of Badger had drawn great strength from his compassionate and down to earth approach to life. He was the consummate professional. Having spent time in both a sabre squadron and Recce Troop he instinctively knew what information was important and what could be ignored. I held his abilities in such high regard that he was carrying out three jobs in Basra Palace: Vehicle Commander, Troop Corporal and Vehicle Fleet Manager. Under such weight of responsibility he never faltered, providing a reliable and organised service well in advance of his current rank. Indeed his talents had been recognised because he was due to promote on posting in March of next year, something I know he had been looking forward to for a long time. I could always rely on information I received from Eddy. He invariably put himself in a position whereby he could influence events. It is no surprise that he was in the vanguard of his last patrol leading from the front, not prepared to ask anyone to do anything he would not do himself. One of Eddy’s greatest strengths lay in his ability to listen to people and then help them using his experience both as a father and as a soldier. I knew Eddy well and liked him immensely. His family was as much a part of his career as soldiering. Our thoughts go out to Gabie, his wife, and Ryan his 18-month-old son who was the apple of his eye. He lived for his family and I know that they, like us, will miss him terribly. Eddy was our friend and our colleague. He had been through all of the successes and hardships before and during the tour to Iraq. He is, and will be forever, part of Badger; none of us will ever forget him. Corporal Steve ‘Eddy’ Edwards clearly relished juggling his role of Vehicle Commander and responsibility for the day to day management of the Company’s vehicle fleet - and it was no mean feat that he excelled in both of them in conditions that might have frustrated others to the point of giving up. He appeared to regard his ‘Panzers’ as a labour of love, and one knew that no matter how depressing the diagnosis of particular vehicle’s ailments that he would do his utmost to ensure the problem was fixed. And he would do this with an absolutely unflappable smile on his face. Again, this was only half of his job, and one with which he was previously unfamiliar, yet got on with it with a determined ease. He was a selfless tactical commander who both knew how to get the best out of his men and always sought to exploit opportunities better to achieve the task in hand. It is typical of him that at the moment of his death he was checking on the welfare of those in his vehicle and all the more difficult for the Company that someone with his experience and dependability has been lost. Perhaps there is some comfort to be had in that he died doing something he both loved and was exemplary at. As those who knew him well would testify, Corporal Edwards was much more than his impressive professional persona showed. He was a wonderfully big-hearted, immensely warm and cheerful character who never seemed to be fazed by the awkward and unpredictable nature of life in this environment. As such his infectiously positive effect on the morale of those around him was a key asset: his passing leaves an awful vacuum that will not be filled easily. The Company is enormously proud to have known him - he was of the very best - and offers its prayers and deepest condolences to his widow and son. It is difficult to write words that will do justice to Eddy; his pride in his job, his joy with life, his deep love of his wife and son. He was always a true professional, putting every effort into being such an excellent “Panzer” commander, and always caring about those around him. I remember when I first met him as a wet around the ears Troop Leader and he took me aside and told me “this is how it really is, right”. Never one to mince his words or hold his peace if he thought he had something to offer - “I’m not being funny boss, but€¦”. “I relied on him so much and the entire Troop will miss him for his dedication and infectious spirit. He always had time for people, was always to the fore when there was hard graft to be done, and was happiest whenever he was in the turret. Nothing more could be asked of him. 2 Troop and Badger will be hollow without his presence. My thoughts and deepest sympathy go out to Gabie and young Ryan, to his brother and to his parents. He was so happy to be a father, and his joy when he talked of Ryan could never be hidden. I cannot imagine the pain of his loss. Eddy was killed fighting for his country, and died staying true to the way he lived his life - by putting the safety of others before his own. I am honoured to have served alongside him, and proud to have been his friend. I will miss him. FEAR NAUGHT. I have known Eddy for many years and have watched him mature from a young Trooper to a competent and well-respected tank commander. Eddy was always cheerful and enjoyed life to the full. I will miss his ready smile, his wit and his warm friendship. My thoughts are now with his wife and son, his parents and family. Corporal Steve Edwards was a man with a big character and just as big a heart, who was always putting others first. He was keen to make sure that no one was left out in any situation and anyone who knew him would smile in his presence because that’s just how he came across. Steve was and always will be a close friend. He always had time to listen, talk and help me through some dark times and I find it hard to put down in words just how much I admired his strength in everything he did. Steve you will be missed and never forgotten. I am proud to be your friend and comrade in arms. Eddie was a larger than life character whose influence was not only felt throughout his Troop, Badger Squadron, and 2nd Battalion of the Royal Tank Regiment, but also by the Irish Guardsmen who had the honour to serve alongside him. He will be sorely missed by all, both on a professional and personal level. If there was ever an official role for a morale officer he would have fulfilled it with distinction. He carried out his duties of a commander with the utmost professionalism and diligence, instilling confidence within all who served with him. He always had their welfare at heart, never putting himself before others. You will always be remembered by all who had the pleasure to serve with you. Our deepest heartfelt sympathies go out to his wife Gabie and his son Ryan. Eddie may you rest in peace. Corporal Stephen Edwards or ‘Big Eddie’ as most knew him was as big in stature as he was in heart and personality. He had a fast humour that I was more often than not the victim of. The banter that passed between us kept each other’s morale high and got us through each day, if I was ever down he was always the first to cheer me up. Eddie was a firm friend. We joined the Regiment just a few months apart and our careers have bounced together for the last fourteen years, having gone up the ranks together and served side by side for most of that time. Corporal Edwards was a professional soldier and an excellent Tank Commander, as a Troop Corporal he was a rock by my side and I greatly valued his experience and advice. Corporal Edwards and I often talked of our families and I know how much he adored his wife Gabie and young son Ryan, my thoughts and prayers are constantly with them at this very difficult time. ‘Big Eddie’ has left a massive hole that is impossible to fill; I will miss him greatly as I know will others. Corporal Edwards was killed in action serving his country where typically his foremost thoughts were the safety and welfare of his vehicle crew and others around him. Steve it was an honour to serve with you, from one true Tankie to another, Rest in Peace my friend and Fear Naught. 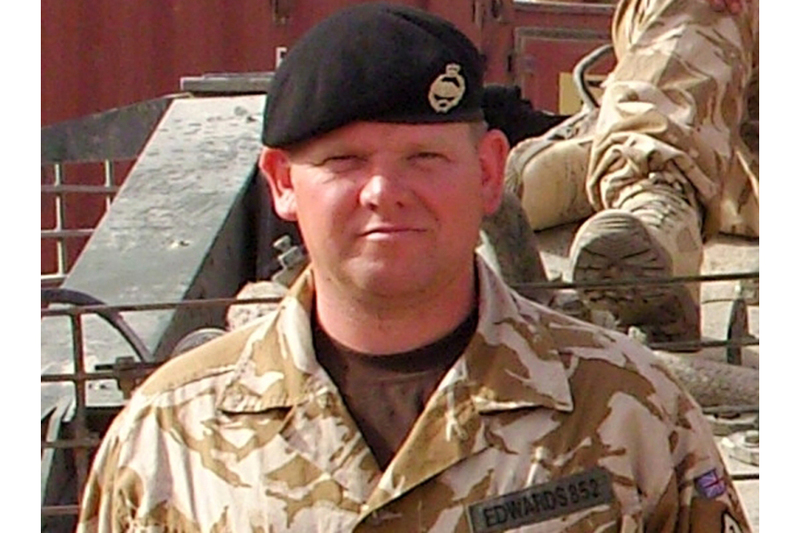 Corporal Stephen ‘Eddy’ Edwards, a big man, with a big heart. Eddy inspired and touched anyone who had the pleasure to come across him. Two of his many qualities that I admired were his loyalty and dedication to his friends and family; Eddy would help wherever he could, a friend in need. At work his dedication to his boys was unquestionable, putting them first and himself last. His professionalism as a fellow commander was one that any soldier, of any rank, could learn from. At home a devoted husband and father. My heart goes out to Gabie, Ryan and his family. Eddy, you will be sorely missed and never forgotten. I am proud and was blessed to have known you as a friend and to have served with you as a comrade. Safe Journey Bud. Corporal Edwards, or Eddie as he was known to most, you’ve been a great character for the whole time I’ve known you. You had a very strong personality and always had a smile on your face to share with others when they were feeling down. I can’t recall a single moment when you were down yourself; you always seemed to have a smile on your face. You were well liked throughout the Squadron and Regiment and it’s been an honour to have served along side you. You were a great Tank Commander and set the standard for many of us to follow. Take care Eddie; the pleasure’s been all mine. Rest in Peace. It was amazing how Eddie’s personality had such an impact on 1 Company Irish Guards in the short space of time I knew him. He always had a kind, humble and calm approach to every situation even when times were hard, which was a good example to follow. For this reason Eddie will be remembered for as long as I can imagine. My deepest thoughts and prayers go to the wife, son and family of Eddie and to the lads in 2RTR. I can only imagine the pain and loss they will suffer. Rest in peace Eddie mate. Eddie you were a great soldier and a very dear friend. You were always one to lead by example. If I had a problem at home, you were there. If I needed guidance at times you were there. I don’t think I ever saw a day go by where you weren’t smiling. No matter how hard times got, you were there to keep up the morale, laughing and joking. I remember the last chat we had, it was about your son Ryan and his first steps and I mentioned my daughters; we were talking for hours. I will never forget you, you will be missed dearly. When your son Ryan grows older he will understand that his father was a great man. Rest easy Stephen, rest easy. I first met Corporal ‘Eddie’ Edwards when I got posted to the Royal Tank Regiment. He was always smiling, talking to all us new Troopers, making us feel more comfortable. When our Squadron went to train in Canada, I had the privilege of being his gunner on Exercise Prairie Brave; we made a good team together. After the exercise Eddie and a few others and I went sailing at Vancouver Island on adventure training. What a great time we had there. Eddie was the sort of chap who you could count on coming out for a laugh with the lads. After Canada we started training up for Op TELIC 10. When in theatre I was in 1 Troop as a warrior gunner, and after a few months I was sent to Basra Palace as Eddie’s Gunner. As I arrived he gave me a warm welcome and instantly made me feel at home, he was my commander at the time when he was killed and it was the biggest honour and privilege to have had a commander and a friend like him. Eddie take care mate you are sorely missed by me and the rest of the Squadron. All our prayers are with Eddie’s family at this difficult time. Well Eddie, I’m not really good at this sort of thing, but I will try my best. I have known you since I arrived in Badger after Op TELIC 7 and got to know you very well. You were the guy who everybody could talk to if they had a problem or a question, and you were liked by everybody. You were a very professional soldier and an excellent commander. You will be missed sorely by the Squadron and the Regiment. Our thoughts are with your wife and child, take care Eddie. Eddie, I never thought I would be writing this. You where a great tanky and friend. You were always someone I could talk to as you made very clear to me many times. The Troop, Squadron and Regiment will not be the same. My thoughts are with your wife and I know your child will grow up knowing how much of a great father and man you were. Eddie mate you will be sorely missed not just by Badger but by all who were lucky enough to know or have met you. You were such a big character within Badger and you made life easier and comfortable for so many of us, always being so easy to talk to and have a joke and a laugh with. There will now be a big hole within Badger that will never be filled, but don’t worry, you will always be remembered, never forgotten, rest easy! I’ve only worked with Eddie for a short period of time, but within that time I’ve seen how respected he his, not only by his workmates, but by me as well. Eddie always had a smile on his face and a good sense of humour to go with it. He got on with all the members that he was attached to in the Irish Guards and that, to me, shows a blinding personality. Eddie will be truly missed by me and all of his Regiment plus the guys in the Irish Guards. My pain and sorrow goes out to all Eddie’s family and friends that I haven’t met, take care mate and be well….your big mate STRETCH. Corporal Eddy, you were a good professional soldier and a good man, you will be missed by our whole Company. Our thoughts are with your family and in particular, your 18-month-old son. We know they will learn of your dedication in Basra and how much you loved your job and Badger Squadron. Rest In Peace, Lest We Forget. Corporal Edwards’ death is tragic and his family and friends have my deepest sympathy. I am sure he will be greatly missed by all who served with him. Losing such an experienced and capable soldier is very sad, but he will be remembered with honour for his years of service to our country.